Legacy Simplecast - What Is An RSS Feed and Why Does It Matter? You may have heard of RSS feeds, but what is an RSS feed and what does it do? An RSS feed is a formatted text document that contains all the important information about your show. It's hosted on a server and (usually) has a public URL/link so anyone can view or access its contents. It contains all the information about your show and your episodes, things like your show’s title, description, episode titles, links to the audio files for the episodes, and more. It is possible to write and update an RSS feed yourself, but it’s time consuming, and errors or typos in a feed can break things, so that's why Simplecast handles creating and updating your show's RSS feed for you. Q: Why do I need an RSS feed for my podcast? The RSS feed provides a way for anyone to subscribe to your show, or stream or download your episodes, either through your website or their podcast app of choice. Without an RSS feed, you’ll only have blog posts or audio files, with no way for people to subscribe and automatically get new episodes unless they visit your website or get a direct download link from you via email or a message. Your show’s RSS feed is what podcast apps and directories (like Apple Podcasts, Google, Spotify, and so on) will use to automatically get new episodes that you publish and display them in their apps or websites, and also pass them along to anyone who has subscribed to your show. Your listeners can also bypass the podcast directories and subscribe to your show's RSS feed directly using any compatible app they prefer to use (as long as it's set up to subscribe to and display RSS feeds). Since RSS is an established standard, there are many apps that can subscribe to and download and display info from RSS feeds. Q: Where do I find my show's RSS feed URL? You'll find your show's RSS feed URL in the Sharing page in your Simplecast dashboard. Q: How do I get my podcast into iTunes, Apple Podcasts, and the other podcast directories like Spotify and Google Podcasts? 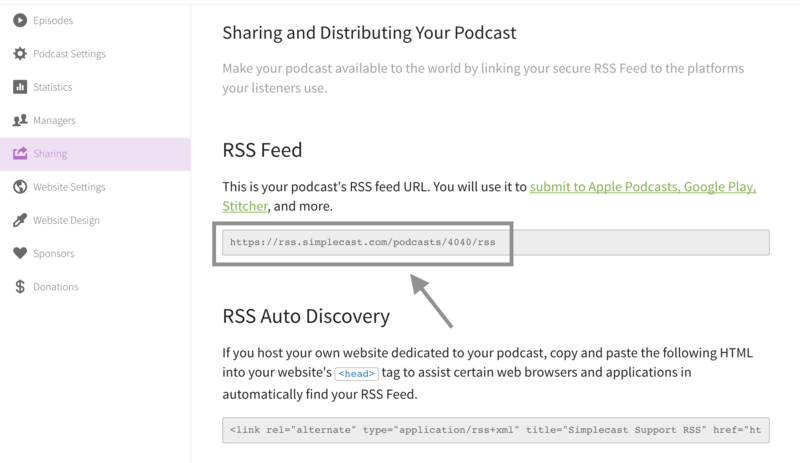 In order to get your show into Apple Podcasts and the other podcast directories, you’ll need to submit your show’s RSS feed URL to them. This is almost always done via a website, like Apple’s Podcasts Connect website or Spotify’s Podcasters.Spotify.com website. Once they approve your show's RSS feed (most places will within 48 hours), they will use the info in the feed to display your show (along with your episodes) in their directory and/or apps. They’ll also check your show's feed regularly to get changes and any new episodes that are added. You've got an RSS feed for your show, and you submit your show's RSS feed URL (the link to it) to the directories. You add a new episode in your Simplecast dashboard, which adds some new lines that contain information about that episode to the feed. Since the directories are checking your feed, they see that information about a new episode has been added to the feed, and they use that info to display the episode in their app. Your subscribers can then get the new episode in whatever app they used to subscribe to your show. Q: What do I do if my new episodes don’t show up in the directories right away or at all? If you can’t see your new episode in any of the podcast apps or directories, then it's possible the podcast directories or apps haven't checked your feed yet or updated on their end (it can sometimes take a few hours for a directory to update, especially if it's a newly approved show). If you can see the episode in all the apps/directories except one, then it’s likely an issue with that directory and not anything wrong with your feed. If you’re concerned, reach out to that directory’s support team and ask if they would mind taking a look. Q: Can I change podcast hosts or RSS feeds without breaking things or losing my show’s subscribers? You can move hosts anytime, although it’s easier with some hosts than with others. Most hosts will copy an existing RSS feed and audio files over to their service and set your show up with a new feed. After you have the URL for the new feed that was setup for your show, you’ll need to update the various podcast directories so they check your new feed for updates and new episodes instead of the old one. This is usually done through the same web portal that you used to submit the show to the directory originally, although some places require you to send an email. Your podcast host should be able to help if you have questions. If you'd like to learn more, check out this article that includes links and instructions for submitting and updating feeds. Q: I've heard about something called a 301 redirect that gets added to a feed when you move your show to a new host. What is a 301 redirect? A 301 redirect is a line of code that gets added to a feed that will forward anyone who visits that feed over to a new feed URL. It’s kind of like setting up a mail forward for an address you're no longer living at. Your podcast host should provide a way for you to add a 301 redirect to your old feed if you’ve moved your show to a new host and have a new feed set up for it. Q: I’ve read or heard about an <iTunes:new-feed> tag that needs to be added to a new RSS feed. What’s that? The iTunes new-feed tag is a line of code that you can add to a feed to let Apple know it's a new feed for the show. Simplecast adds this tag automatically whenever an existing show is imported in Simplecast, so you don't need to worry about adding the new-feed tag yourself. We've got that covered for you.